Some 24 hours after National Hunt’s prized thoroughbreds were put through their paces, so English rugby’s frontrunners overcame another major hurdle in their quest to reclaim the Aviva Premiership crown. 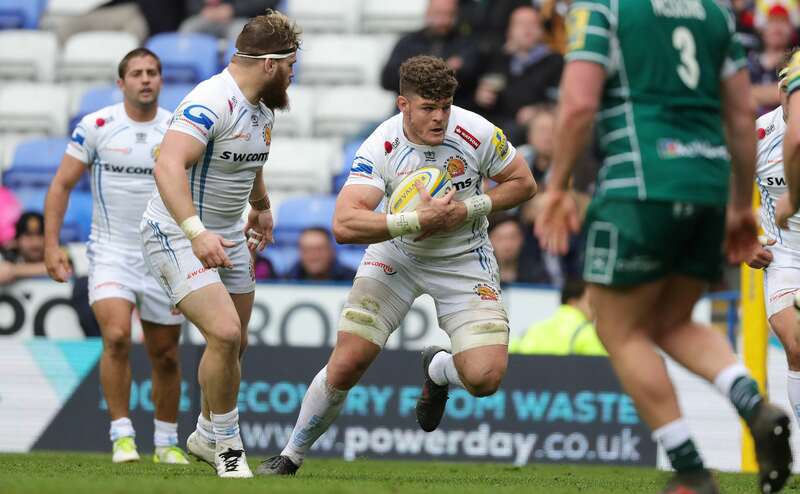 At a hunting ground which in the past has proved somewhat troublesome, Exeter Chiefs booked themselves home advantage in this season’s play-offs with a silky, smooth performance against lowly London Irish. Rob Baxter’s side dominated from start to finish, producing a champion-like display that yielded not only six tries, but also put them firmly on course for a first place finish at the end of the regular season. England international Sam Simmonds led the charge for the visitors, helping himself to a hat-trick of tries to take him to 12 in the Premiership, one behind current pace setter Josh Adams of Worcester Warriors. Alongside Simmonds, fellow forwards Ben Moon, Mitch Lees and Jack Yeandle also got in on the try-scoring act as their dominance up front proved significant in the end outcome. Fly-half Gareth Steenson, on his return to the starting line for the first time since February, weighed in with the remainder of the points, converting all six tries, as well as slotting a second half penalty. Irish winger Joe Cokanasiga claimed a consolation score during the second period, but that was their only bright spot on an afternoon which has left them needing somewhat of a rugby miracle to preserve their top flight status. Fresh from an impressive home win over Gloucester the week previous, Baxter made a handful of changes for this latest encounter against the league’s basement club.Into the pack came Moon, Lees and Dave Ewers, while behind Steenson, Santiago Cordero and Jack Nowell were also in from the outset. Irish, meanwhile, were in buoyant mood having given their survival hopes a lift with an impressive victory at Harlequins last time out. They made just one change in personnel, bringing in Sebastian De Chaves to the engine room with Josh McNally switched to the back-row at the expense of Jake Schatz. Much of that success for the Exiles was based around a storming start at The Stoop, but the Chiefs - having been warned by Baxter in the week - were having none of it and flew at their hosts like an exocet missile. Just three minutes had elapsed when the leaders claimed their opening points of the game. A strong carry from full-back Lachie Turner, supported by compatriot Mitch Lees, propelled the visitors to within yards of the home line, the fruits of which resulted in a rare converted try for prop Moon. Handed the dream start, the Chiefs were quickly back on the attack and threatened just moments later when half-backs Steenson and Nic White scythed open the Irish back line to feed Don Armand in space. However, as the England international looked to pounce, he could not cling onto possession with the line in sight. Two minutes later and the hosts were again spared, this time Chiefs lock Jonny Hill was denied a score in the right corner after the officials had adjudged Turner’s final pass to him had strayed forward. It was proving one-way traffic, however, and with the bit between their teeth, the Chiefs didn’t take long to double their tally. A swift counter out of their own half helped to launch the impressive Ian Whitten down the right - and as the Irishman drew in the cover, waiting on his shoulder was Simmonds, who needed no second invitation to dot down in the corner. Steenson obliged with the extras for that score and Exeter’s third, which arrived just past the half-hour through Simmonds once again. The flame-haired No.8 was on hand to apply the finishing touches after Hill had taken a line-out just five metres from the Irish line. The Chiefs could - and probably should - have added to their tally before the break, but a combination of stubborn home resistance, coupled with the odd handling error, meant the scoreboard remained untouched as the two teams headed for the sheds. Up against it, the sight of Steenson extending Exeter’s lead inside two minutes of the restart with a routine penalty was hardly the kind of start the Exiles would have envisaged following their half-time pep talk. Sadly, it would get no easier for the home side as Baxter’s side once again started to flex their muscles. Another slick attack, instigated on this occasion by Simmonds and Waldrom, saw the ball shipped through the hands of both Turner and Nowell, before Simmonds was on hand to finish off for his hat-trick score. Irish, already down and out, continued to front up and like a punched-drunk boxer, they hauled themselves off the canvas to claim some reward. Tagging Turner back behind his own line after a chip kick in behind, they used the subsequent scrum as the platform to create the opening for Cokanasiga to bulldoze his way over in the right corner. It was a moment of celebration for the ‘Men in Green’ - but it merely acted to kick the Chiefs back into gear heading into the final quarter of the game. With both sides having emptied their benches, it was the fresh muscle from the visitors which proved the more significant. Working their way through a series of attacking phases, the Chiefs got to within sniffing distance of the line, where upon the hulking frame of Lees collected possession and burrowed his way over the line for a fifth converted score. Steenson’s reliable right boot plundered the extras to that score and his side’s final score, which arrived with just three minutes left on the clock. Having conceded another soft penalty midway inside their own half, Steenson dispatched the kick to the corner and the Chiefs pack did the rest. Just five metres out, every rival knows what is coming from the Devonians, but trying to stop it is another art in itself. 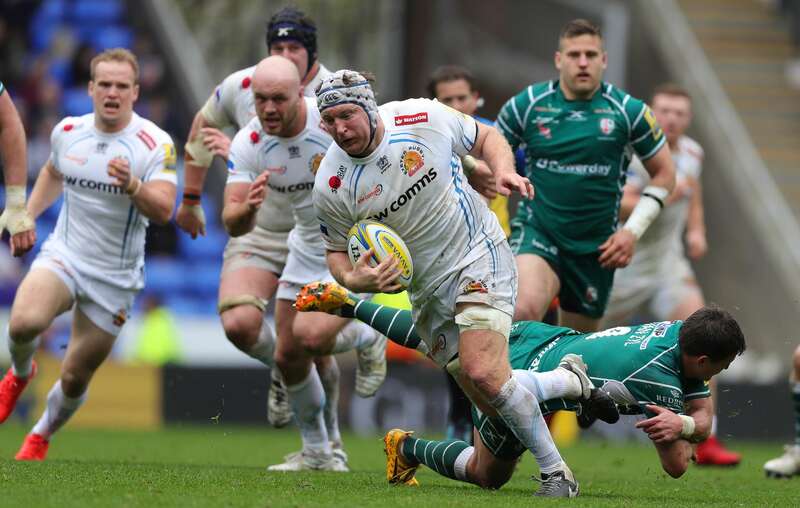 As the shove was applied from the Exeter eight, plus the addition of Sam Hill, it was club captain Yeandle who emerged from the heap of bodies to claim the adulation of his team-mates and seal a fine day at the office for the Chiefs. Two more regular fixtures remain for the Chiefs - against Sale (home) and Harlequins (away) - after which it’s semi-final time, where we all know what victory in that game brings. Irish: T Bell (F Mulchrone 34); J Cokanasiga, T Fowlie, T Brophy Clews, A Lewington (A Tikoirotuma 55); J Marshall, P van Zyl (S Steele 61); B Franks (G Reid 51), D Paice (D Porecki 51), O Hoskins (P Du Plessis 51); F van der Merwe (capt), S De Chaves (J Basham 75); J McNally, M Northcote-Green (J Schatz 4), O Treviranus. Chiefs: L Turner; J Nowell (T O’Flaherty 66), H Slade (S Hill 55), I Whitten, S Cordero; G Steenson (capt), N White (S Townsend 55); B Moon (M Low 55), L Cowan-Dickie (J Yeandle 50), T Francis (H Williams 50, B Moon 77); M Lees, J Hill (S Skinner 61-75, 77); D Ewers (T Waldrom 17-25), D Armand (T Waldrom h/t), S Simmonds.